Excessive cardiovascular exercise uses energy the body requires to build muscle mass. Running is a cardiovascular exercise, which explains why bodybuilders spend little time on the treadmill. Performance enhancement coach Rachel Cosgrove, C.S.C.S., warns you will lose muscle if you run too much, too often and if you do so right before eating. But running and other forms of cardiovascular exercise can help build muscles if the balance is right. Nutritionist and training expert, John Parillo, includes marathon running in his sports-specific training for bodybuilders. Parillo says "Aerobics can enhance your recovery from weight training by promoting blood flow and oxygen transport to your muscles." Good blood circulation ensures nutrients reach the body's tissues and also removes toxins efficiently. Parillo concludes a poor diet is more likely to be the reason for muscle loss than aerobic exercise, such as running. According to the The American Council on Exercise, you can increase the intensity of your aerobic exercise, including running, by using 1- to 3-pound hand weights. However, weights heavier than 3 pounds are not recommended, since they can damage the muscles and joints in your arms and shoulders. Some runners and body builders do boxing punches as they run, using light weights or wrist weights, to further enhance and build muscle tone. Rachel Cosgrove warns that running every day depletes the calorie levels needed to sustain muscle mass, so program your running for two or three times a week rather than daily. She also suggests sessions be kept to a maximum of 45 minutes, beyond which time, necessary muscle-building calories are burned off. There is natural muscle loss during sleep, so a morning run on an empty stomach is a recipe for losing more muscle. 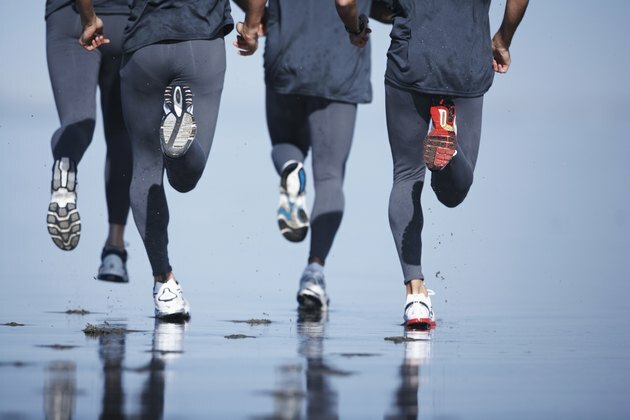 Running can enhance muscle mass when correctly programed in your workout schedule. The cardiovascular benefits of running help burn fat and improve blood flow for healthy muscles. Competitive bodybuilder, Tom Venuto, says the best combination for building muscle is to eat the right amount of protein and carbohydrates and do regular cardiovascular training such as running. ACE Fitness: Fit Life -- Do the Benefits Outweigh the Risks if Individuals Hold Dumbbells in Their Hands While Doing Step Aerobics or Other Cardio Activities?